Home Black Girls Love Books Interviews literature Susan Fales-Hill On Life, Career and "Imperfect Bliss"
Over the years I have gathered a few mentors in my head. Some of these women I have met and some I have admired from a distance. Susan Fales-Hill is definitely one of these mentors. I first learned of Mrs. Fales-Hill from an article in Essence, that was highlighting her first book "Always Wear Joy". I was enthralled by this woman and her mother, Josephine Premice. Being of Haitian descent, as they are, I wanted to know more about them. What their journeys have been like, what lessons they wish to teach others, and just how they have maintained their glamor and endearing aura in a world that doesn't always appreciate such traits. I ran to my local Barnes and Nobles and purchased the last copy of this book (that I still own to this day). Since then, I have remained a fan and supporter of Mrs. Fales-Hill. Last week, I had the amazing opportunity to interview her and talk about her new book, "Imperfect Bliss." I must say she is just as gracious, intelligent, and heart-warming as I imagined...and more. 1. When did you decide that you wanted to venture into the world of writing novels? The novel is my favorite literary form so it was a lifelong dream of mine to write them. That said, having been weaned on "the greats," it wasn't till middle age that I felt I could dare to enter the "Pantheon," even of commercial fiction. Now with my fiftieth birthday five minutes away, I'm in "if not now, when?" mode. There is no novel written by a corpse, though some of my less charitable on line critics may claim mine are. 2. What has been the most rewarding aspect of being able to create your own stories? The most rewarding aspect of writing fiction is that one, you can tell the truth with impunity, and two you can write about the world as YOU know it, not according to the bizarre demographic rules of Hollywood in which all women are between the ages of 22 and thirty, white and seem never to have been acquainted with black people who were not in service to them as housekeepers or the modern iteration of that role, "trusted assistants." I get to write about the magnificent American mosaic, the multi-cultural truth of our nation that goes back to its founding. 3. 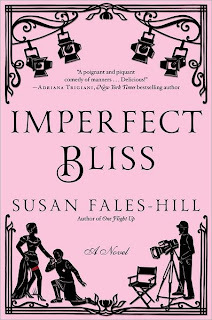 "Imperfect Bliss" has been described as a modern spin on Jane Austen's style. Was this intentional or more of a literary coincidence? It's no coincidence. This is a deliberate "re-telling" of the tale. It's "Pride and Prejudice" in a new millennium key. 4. In "Always Wear Joy" you allowed readers a generous glimpse into your childhood and relationship with your mother, the amazing Jospehine Premice. Have you ever borrowed or been inspired by your mother's joie de vivre to breathe life into a character? My mother's irreverence, wit, chic, pain, love and warmth infuse all my creations. The mother in "One Flight Up" had a lot of my mother in her (though the character was white.) My mother was far less self centered than that character, in fact she was one of the most selfless people I know, but India's mother's adoration of her, ability to verbally vivisect others and disdain for the rules of the "norm" were pure Josephine. Her heartache was also my mother's. The mother in "Imperfect Bliss," a self-loathing British Caribbean woman, is pretty much my mother's polar opposite but there's one tiny dimension of her that is borrowed from my mother. I won't spoil it for the reader by saying which facet of her personality that is...They'll have to buy the book and guess. 5. It's been almost two years since your last book, "One Flight Up" was published. How do you feel you have grown as an author between then and now? Hopefully, I'm improving. The process was certainly smoother this time around but each time one begins, there is the blank page. It's Sisyphian, hopefully I'm getting better at rolling that boulder up the hill. I would also say that with maturity comes perspective. I'm in a better emotional place than I was when I wrote "One Flight Up," (in full on midlife crisis!!!) A greater sense of optimism infuses my current work. 6. Many fans were hoping for a sequel to "One Flight Up". Do you think you will ever revisit India Chumley (the protagonist) and her friends and continue their stories for us? 7. What advice would you give to a young woman who is starting her career as a writer today? I would say go for all mediums, be multi-platform. If you have the opportunity to train as a journalist, a television writer, anything that requires strict adherence to a form and deadlines, go for it. Learning a craft will stand you in good stead even if you want to write sonnets for literary journals down the line. My years in television writing taught me character development, dialogue, plotting and pacing. Prose is a different animal, but many of the skills necessary to dramatic or script writing translate to writing books. Similarly, the linguistic precision required of a journalist, the brevity and the non-negotiable deadlines prepare one well for the rigors of writing books. Finally, I would pass on the sage words of the late, great, Roscoe Lee Browne, "Don't get it right, get it written." Just do it!!! 8. If you could describe "Imperfect Bliss" in three words, what would they be? "Perfect Bliss," the idea: A day with my daughter.